One of the reasons I love history is that it provides context and perspective for any irritation, frustration, or hardship that pops up in my own life. Case in point: it’s that time of year when lots of people start feeling antzy. Shut-in. Claustrophobic. Bored. Understandable, but let’s think back. 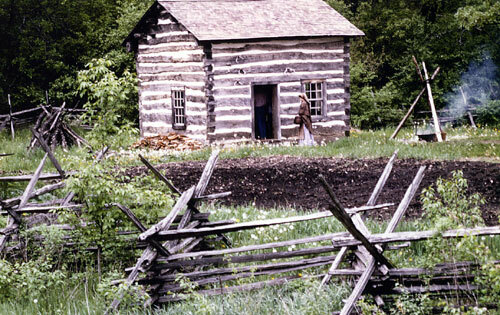 One of my favorite buildings at Old World Wisconsin (Eagle, WI) is Fossebrekke, a cabin restored to its 1845 appearance. That's me in warm weather, heading into Fossebrekke, 1983. It’s so small that visitors sometimes mistake it for an outbuilding. On the occasions when I interpreted that building, I loved helping guests see it from the perspective of Knudt Fossebrekke. In 1839 Knudt had—like so many others—arrived America with almost nothing. He spent his first winter in a shelter of some sort dug from the side of the hill. After that, it must have felt wonderful to complete this sturdy little cabin! Bea and Sandy in Fossebrekke, probably late 1980s. Oral tradition also suggests that Knudt and his wife Gertrude opened their cabin to other immigrants who arrived as winter was bearing down. Some say seventeen people wintered in the tiny cabin one year, although it’s impossible to know now if that count includes people coming and going, or people there all at once. In any case, sharing the space—one room and a loft—was both generous and, I imagine, very challenging. 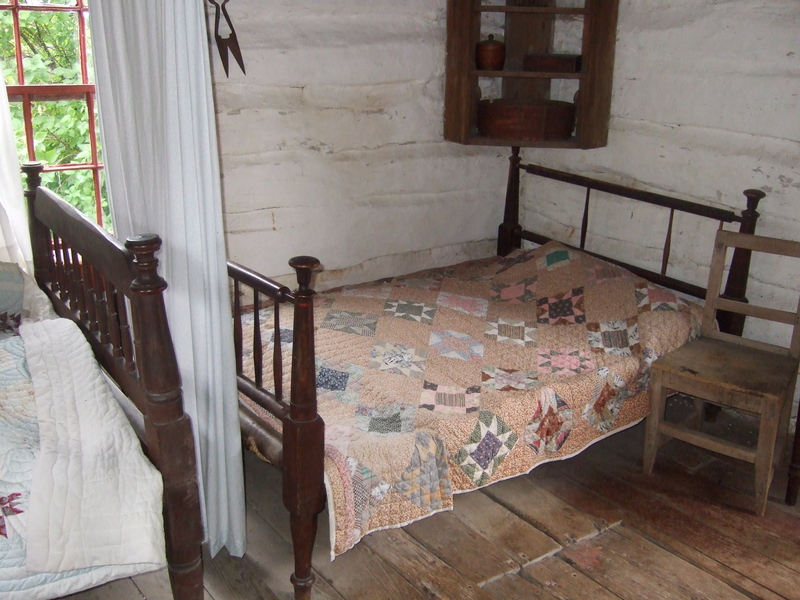 We get a glimpse of the other side of frontier hospitality from Elizabeth Koren, a Norwegian pastor’s bride who accompanied him to Iowa in 1853. They arrived in winter; no handy parsonage was waiting. Erik and Helen Egge invited the Korens to stay with them, and their two young children, in this 14 x 16′ home. 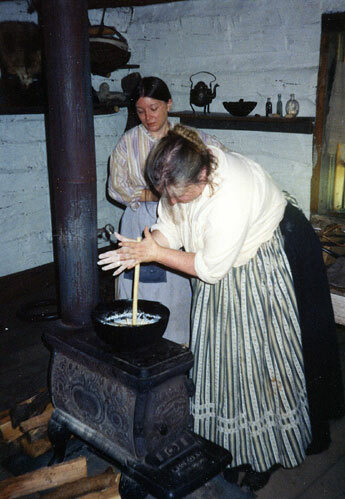 The Egge-Koren home has been restored at Vesterheim Norwegian-American Museum in Decorah, Iowa. 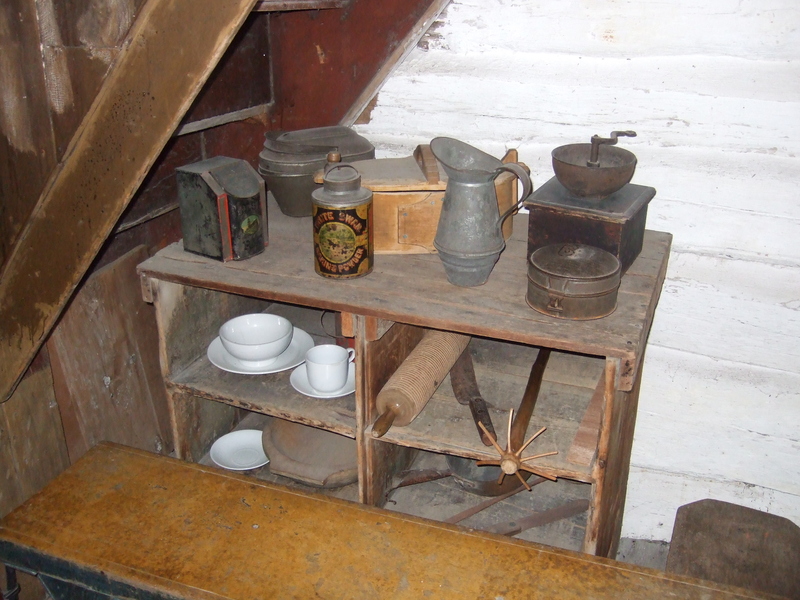 Elizabeth, who had lived a genteel existence in Norway, found the close quarters noisy, smelly, and often challenging. Both adult couples slept downstairs, with only a curtain to provide a facade of privacy. The children slept in the loft. Tight quarters, with no space wasted. 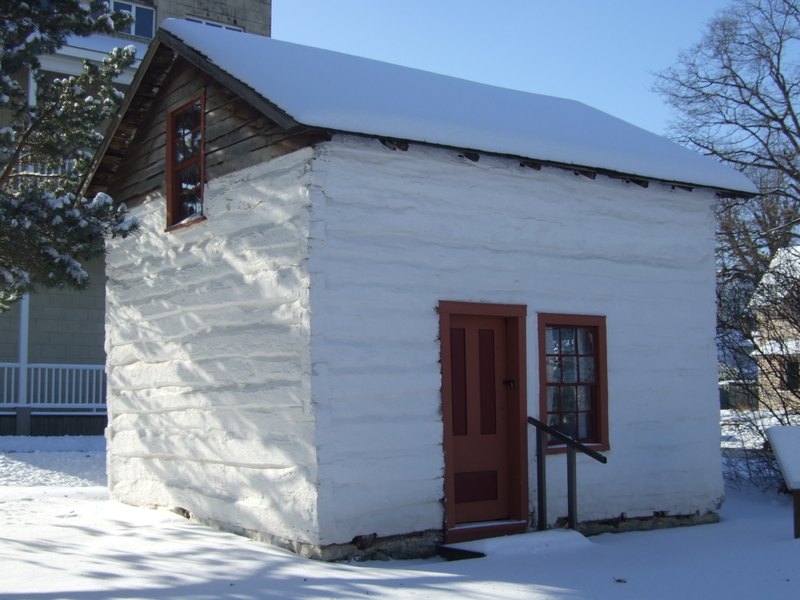 Reverend Koren wrote his sermons in this cabin.